Would Stephen Harper attack Libya simply to justify spending tens of billions of dollars on F-35 fighter jets? Perhaps. But, add on doing it for major Canadian investors, reinforcing his “principled” foreign policy rhetoric and reasserting western control over a region in flux, and you pretty much have the range of reasons why a half dozen CF-18s four other military aircraft and naval frigate are currently engaged in combat 10,000 km away from Canadian soil. 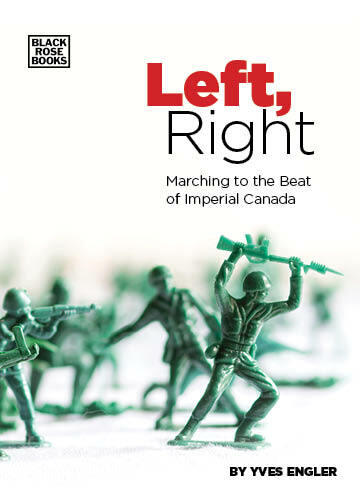 Over the past five years, the Conservatives have further militarized Canadian foreign policy. Military spending is at its highest level since World War II — the Harper government expanded Canada’s role in the occupation of Afghanistan, claimed that Russia is planning to attack and sent 2,000 troops to police Haitians after a devastating earthquake. The Conservatives draw significant support from the military as well as its associated companies and culture. To get us in the fighting spirit, for instance, the Canadian Forces released onboard video footage of a CF-18 destroying a ground target in Libya. But there is more to it than pleasing the Great White North’s version of the military-industrial complex. On March 21, The Financial Times reported that western oil companies were worried that if Gaddafi defeated the rebels in the east of Libya he would nationalize their operations out of anger at the west’s duplicity. Presumably, this includes Suncor, Canada’s second largest corporation, which signed a multi-billion dollar 30-year oil concession with Libya in 2008. Home to the second largest amount of Canadian investment in Africa, instability in Libya has put a couple billion dollars worth of this country’s corporate investment in jeopardy. Dru Oja Jay, editor of the Dominion and a candidate for the Mountain Equipment Co-op Board of Directors, notes “Canadian investors are legitimately worried about what’s going to happen to the $1 billion signing bonus Suncor paid out to the Libyan government, or whether SNC-Lavalin is going to recoup its investments in the country, which is home to 10 per cent of its workforce.”And these are some of this country’s most powerful corporations. Embassymagazine includes both Suncor and SNC-Lavalin’s CEOs among the nine most influential business executives in determining Canadian foreign policy. Would a victorious Gaddafi have moved against Canadian companies? Even if he didn’t, with all the bad press SNC and Suncor have received could they continue in Libya without regime change? Finally, will the rebels dependence on the west lead to better contract terms? Unlike Egypt or Tunisia, the Conservatives denounced Gaddafi’s repression at the beginning of the Libyan uprising. This is partly because Gaddafi has never been on great terms with much of the West, even if there have been warmer relations in recent years. Also, the Conservatives were widely derided for supporting Egypt’s Hosni Mubarak and (to a lesser extent) Ben-Ali in Tunisia to the bitter end. So Libya gave Harper an opportunity to re-affirm his “principled” foreign policy rhetoric. Beyond wanting to appear on the side of human rights and democracy, another element motivating the military intervention in Libya is the desire to influence the revolutions in bordering states Tunisia and Egypt, which are still in flux. Controlling Libya gives the West another point of leverage over developments in those countries. Bombing Libya tells democratic forces in the region that the west is prepared to use force to assert itself (as does tacit support for the Saudi military intervention in Bahrain). Beyond the inevitable death and destruction in Libya, the security council resolution further undermines state sovereignty, which provides the weakest states with some protection from the most powerful. This is the main reason why many Latin American and African countries have opposed the intervention. Finally, let’s put the current moral outrage in perspective. A little over two years ago Israel launched a 22-day onslaught against Gaza that left some 1,400 people, mostly civilians, dead. There, the power imbalance between the two sides was much greater and the aggrieved population had been under the boot of the attacking force for as long as Gaddafi has ruled. Yet there was no talk of imposing a no-fly zone over Gaza. In fact, the Harper government cheered Israel on.